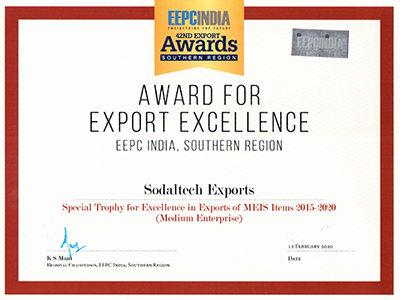 The Indian Institute of Packaging PACMACHINE awards for Excellence in Packaging Machinery Design for SODALTECH Composite Can Making Plant, SODALTECH Spiral Paper Tube Plant, SODALTECH Fibre Drum Making Plant, SODALTECH Automatic Paper Cone Plant. 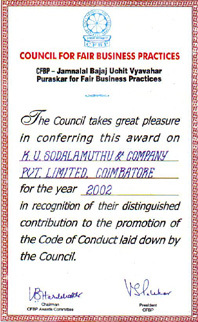 Also won the Prestigious JAMNALAL BAJAJ award for Fair Business Practices. 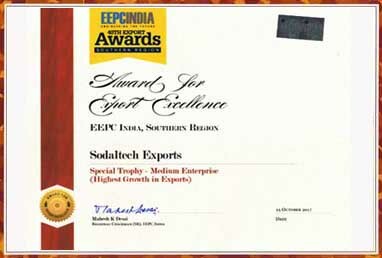 Our machinery and plants have been exported to several countries including Mexico, Brazil, Finland, Turkey, Nigeria, Kenya, Zambia, Ghana, Russia, Sudan, South Africa, Egypt, Iran, Saudi Arabia, Kuwait, Syria, Sri Lanka, Bangladesh, Thailand, Singapore, Malaysia, Libya, Lebanon, Bulgaria, Italy, Indonesia, United Arab Emirates etc.